No one actually understands quantum mechanics. Even Albert Einstein himself had problems accepting whether it was true, despite �evidence� to the contrary. In fact, it is said that if you aren�t shocked by what quantum physics points to, you cannot possibly have understood it. The big problem for physicists was how to resolve the problem of the double slit experiment (also known as Young�s Experiment). 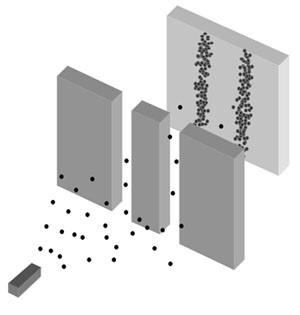 Basically, the double slit experiment comprises a metal plate with two parallel slits. 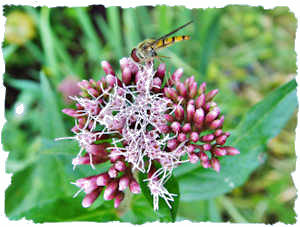 The beauty of this simple arrangement is that it is able to show us the properties of things. If, for example, a stream of tiny metal beads are fired towards the plate, each bead being slightly smaller than the width of one slit, two streams of beads will emerge on the other side, hitting the opposite plate. 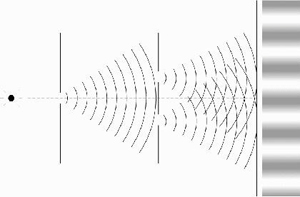 If the second plate is some form of detector screen, over time two parallel lines emerge. Now, suppose we take light, which is made up of electromagnetic waves. Viewed from the side, waves oscillate up and down, like a long undulating snake; viewed from above, waves look like the ripples on the surface of a pond after a stone has been thrown in. What has to be remembered about waves is that they also travel outwards in all directions from their source, not just in one direction as the stream of beads do, and as a consequence, only a certain number of light waves will pass through each slit. Of the waves that do make it through, however, they effectively render each slit another light source, with light emanating out from each slit in all directions. Physicists decided to look at the properties of electrons. 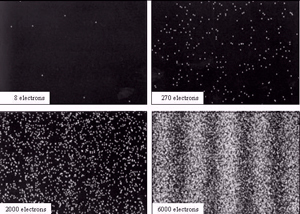 Electrons are tiny pieces of matter, like the metal beads, but much much smaller. So, when they fired a stream of electrons at the two slits, what they expected to see was two parallel lines on the second plate. Wrong! Believe it or not, what they saw was an interference pattern. Now, you would only expect to get an interference pattern � a continuous series of bands � from something that has the properties of waves. But electrons are matter, not waves, aren�t they? So perhaps the electrons are bouncing off each other and that sort of makes them behave like waves? In order to verify their results, the scientists decided to fire single electrons through the slits, one by one, so there was no way that the electrons could bounce off each other. But guess what? They still got an interference pattern! The only conclusion that can be drawn from the evidence produced is that the electrons also have the properties of waves. Understandably, the scientists thought this does not make logical sense. Obviously, an electron as a piece of matter can only go through one of the slits at any given time. We only ever get an interference pattern when waves come from both slits and �interfere� with each other. Thus, in order to see exactly what was going on, what the physicists then decided to do was to put a measuring device right next to the slits in order to determine which slit each electron was actually going through. But when they started to observe the electrons going through the slits, one by one, what did they see on the second plate? Two parallel lines! The same pattern they got when they fired a stream of beads. In other words, the electrons were now behaving as if they were matter. Now it may well be that the measuring apparatus was contaminating the results but repeated experiments have consistently yielded the same results. So what conclusions have scientist come to? After nearly a century�s worth of scientific thought and investigation, scientists have realised that the only explanation that can be drawn from this experiment is that electrons exhibit both the properties of waves and matter, depending in some way upon whether the electrons are being directly observed or not. In other words, when the electrons are not being measured directly, they exhibit wavelike properties, producing in this instance an interference pattern; when they are being measured directly, they �collapse� into matter, producing the two parallel lines. When you aren�t looking, they have waves of potential � they could be in a multitude of different places at once; when you are looking, they are particles of actuality � they have specific �material� characteristics. In fact, mathematically, it is even more complex. For the record, the single electron passes through one slit, both slits, neither slit, as well as all three possibilities at the same time. In other words, it can be here, there, everywhere and nowhere, simultaneously. It�s what scientists call �superposition�, which means that there are multiple states available for the electron to �collapse� into when the process of direct observation is initiated. Of course, there are other interpretations, like for example the many worlds view that states that all possible superpositions do in fact collapse but each one materialises in a unique world of its own � it�s effectively what we think of as parallel universes. But the superposition theory explained in detail above represents the most popular view. Shocked by all of this? Good. Now we are starting to get somewhere! Let�s back up a little here.  First of all what does �quantum� actually mean? All it means is �amount� or �quantity� and it is used to refer to the smallest measurable unit. That�s all quantum really means. But the concepts it�s referring to are a completely different matter � a world governed by its own internal logic, which is seemingly at odds with the laws of classical physics. One of the greatest physicists of the twentieth century, Niels Bohr, said, however, that quantum wave/particle duality is not problematic � they are simply complementary aspects of the same thing. One way to think of it would be to consider the nature of light � it too has two types of properties, in that it behaves both as a wave and also as packets of energy, more commonly known as photons. Which one is it? Face or vase? And what determines which state it is in? The answer is we do. The point is that when the observer is looking at something, the very act of looking at it determines what type of thing it is, gives it specific characteristics. In other words, the observer is intimately connected on some level with the observed. This is very different from the view held in classical physics that objects have a separate existence and behave in a specific way, whether they are being looked at or not. Here�s another way of thinking of it: take a cat and put her in a box with a radioactive atom and a Geiger counter. Assuming that the atom will start to decay as per any normal radioactive element, it will emit radiation, which in turn will be picked up by the Geiger thus making it tick. The ticking of the counter will trigger a hammer; the hammer will break a phial of cyanide and, sadly, kill the cat. Within the space of an hour, there is, let�s say, a fifty fifty chance that the radioactivity will have decayed enough to have triggered the hammer, let out the poison and killed the cat. So, if observer and observed are connected, what exactly is it that connects them? And how does an electron know that it is being observed so that it makes the decision to be one thing or another? To that question, nobody really knows the answer. Nevertheless, there have even been experiments conducted that show when two electrons, which have been created together, say in an atom, are then separated, whatever action is performed on one electron, the other electron will also display a reaction, as if it too were being acted upon. And yet, the two electrons could be miles apart � a universe in fact! They call this �quantum entanglement�, which means that everything is quite literally entangled, or joined together, in some fundamental way. 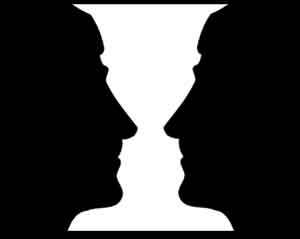 Think of the two faces and the vase. Did you think to see the computer screen underneath? Even Einstein could not accept these types of non-local � that is, separated by a distance � phenomena, which he coined �spooky action at a distance�.